CANDY CORN OREOS. They are real. Earlier that week, Sebastian and I struck OUT trying to find them at the Eagle Rock Target, which made us wonder if it was all just a joke, but honestly, we were just too early in trying to get them. Erin found them easily just a couple days afterward and said that the store had an entire section packed to the gills with the things, so if you want them now, it should be very easy to procure a bag. All the Halloween stuff is up as well. 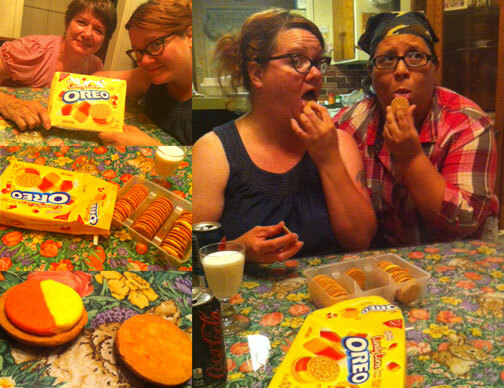 Our specialized candy corn OREO testing lab was located at Rosemary’s house. 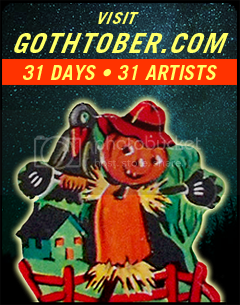 Rosemary is a big fan of Gothtober, and with daughter, Lori, is collaborating on what will be DAY 15 on the Gothtober calendar. So we had Erin who BOUGHT the Candy Corn Oreos, Rosemary and Jason who supervised us, and Lori and Erin and I were the courageous guinea pigs. Erin was especially brave, because she had a very traumatic candy corn barf story from her youth that involved winning a giant bag of candy corn in a drawing contest and eating the entire bag of tri-color candies… resulting in bright orange projectile uh… fireworks. Now… we could just hate on these, because they are absolutely artificial and outside of the regular OREO realm of decency. But Erin made a good point: What is a candy corn supposed to be?” Corn?!? No, it’s not supposed to be corn. It’s a reminder of corn, especially since it’s three times the size of a regular kernel of corn. Candy corns, invented in the 1880s are naturally predisposed to the artificial flavors that are the hallmark of its candy-ness. Once upon a time when candy corns were hand made, the predominant flavors were honey and vanilla. Those flavors are easy enough to imitate in today’s lightning speed automated factories. Even Brachs candy corn has artificial flavoring, in addition to the real honey of its recipe. So when you open the bag, you get a whiff of “artificial flavor” which didn’t surprise us one bit. We’re not bothered that a cookie with artificial ingredients is attempting to replicate a candy that also possesses artificial ingredients. We peeled the cookie halves apart, and could see the divided filling which contains one half of yellow, the other half is orange. I was able to separate the filling into two separate units of color for tasting. Can’t be positive, but it seems like the yellow side had more of a candy corn taste. But at that point, I might’ve just been high on sugar. It’s definitely a very sweet cookie, and Lori said “Since I first started eating them I began talking a lot more.” We were all talking a lot more. I’d have to say that if the customary white, orange and yellow coloring and the triangular shape makes a candy corn, so does the texture. Ultimately, this is how the candy corn OREO fails, because a candy corn just isn’t a cookie, and vice versa. A candy corn’s weird waxlike density combined with the sugary vanilla flavoring is the ultimate juxtaposition of what will convince your mouth that something “tastes” like candy corn. Otherwise, this cookie just tastes like frosting between two sandwich cookie pieces, which crumbles into very non-candy-corn-like disorderly particles. Out of 10 points, 10 being the best, we gave it a 5. Why a 5? It stands alone as a very sweet cookie, the filling seems like the kind of pre-packaged tubes of frosting that is sold in the cake aisle of the grocery store. The quality of the “cookie” part of the OREO is quite good, very crisp and simple. You’d never in a million years know it was candy corn flavored if you tried one of these in a blind taste test. And you might be sort of turned off by the artificial flavors… but after time goes by, you might feel like eating another one just because its there.